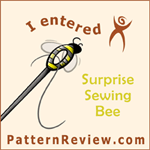 I just stumbled on this Surprise Sewing Bee Contest on PR and I think it looks like a lot of fun! I will probably fail at committing the appropriate number of hours as early as week1 but I want to try! I’m happy to know other people are signing up!! That’s a very good point! I just hope the challenges will be general enough to make useful garments!